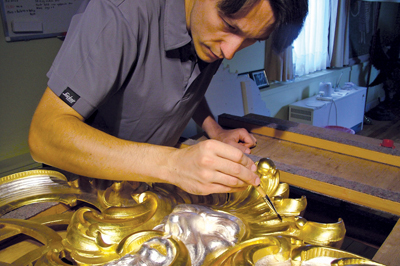 Yuri Karpov is a qualified conservator/restorer of antique furniture, and right now he is working on a private collection of the Kerr family, Marquis of Lothian. 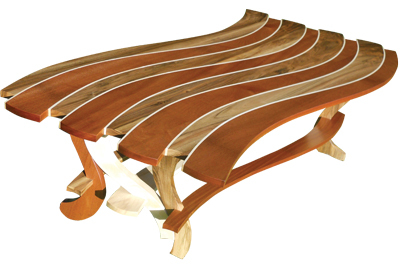 He enjoys designing and creating new unusual pieces of furniture using traditional hand tool techniques. Yuri Karpov: Right now I am restoring a magnificent pedestal octagonal table for Newbattle Abbey College. It has a complex combination of different techniques on it such as inlay, carving and turning, but has been damaged through the years and now will be brought back to its former glory. YK: Actually, because of restoration. After restoring many different furniture items, at some point, I was overwhelmed by different ideas in my mind which I wanted to make into pieces of furniture or other decorative interior items. YK: Natural and architectural forms, music, food, relationships, whiskey, tobacco, pictures, even silence. Sometimes words and sentences, but from a deeper perspective, it is mostly the spirit or spiritual part rather than the form on its own. YK: Some are very classical like Verdi or Beethoven, not very religious as Handel but sometimes a little bit innovative and revolutionary like Bach. Sometimes passionate like Spanish guitar and harmonious like a good instrumental jazz. There might be a splash of rock here and there but mostly well-balanced pleasing compositions. This is what I would like them to be, let's put it this way. YK: As a personal mentor, a Russian restorer called Luganskiy Valentin. Unfortunately, he is not alive any more. 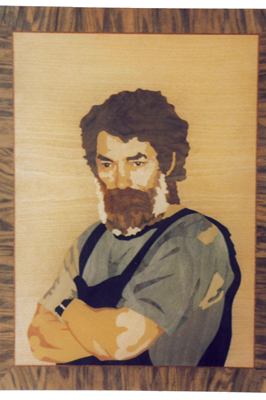 He was the person who helped me to set up the basis of the understanding of working with wood as a respected, living and unique material. YK: It is about the perfect combination of both, where design is an idea in the mind and techniques are the physical application of such ideas in the best possible way. In fact, this perfectly illustrates the name of my business logo, which is Creative Mind in Golden Hands. YK: Not at all. In fact, I think the very opposite. I think optimisation and mass production, alienation of manual processes in woodworking, went too far. Wood is not a man-made, consistent material like plastic, for example. It is a unique, living material that needs a human feel and touch in order to release the best potential in it. The quality, inspiration, skills are in danger. How can you persuade a new generation to dedicate their lives to woodworking, where nothing can be done with a click on your keyboard? 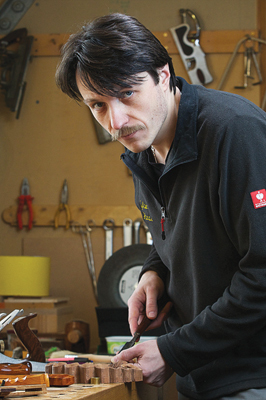 YK: Being a member of the Scottish Furniture Makers Association helps a lot. In a year there are at least three, but sometimes up to five different exhibitions in different towns in Scotland. But generally I am in constant search for a perfect place to show my work, whether it's a gallery or stand or fair. I am always open to suggestions and welcome new professional contacts. YK: Very comfortable. In fact, what people think they want to see as a final result and what they draw on the paper is not always the same thing. Therefore to work at someone else's design is not about how to make it, it is more about how to understand exactly what they imagine and then suggest the best possible way to achieve it in a real form. YK: Basically, I am transforming an idea into something real and tactile. When an idea goes through my mind, I get engaged in a search for a form, colour, shape, proportions and so on. All the architectural process happens in my mind till I see the object transformed from the idea into some sort of shape in my head. This process of search for transformation goes on for an unknown period of time, sometimes for years, sometimes for an hour or even less. It depends on the idea. As soon as the idea has gained a satisfying form, I try to make a very brief sketch or drawing as a record for myself with approximate measurements. YK: A bit of both. I do enjoy detailed, patient and intricate processes leading to a perfect result that comes out of its shell little by little. In the same way, having a headache about a certain form or a complicated joint is an equally enjoyable process to me. YK: I see this as communication between the material, the spiritual idea and myself, where all three have to be able to express themselves freely and openly. Sometimes I am waiting for the material to tell me something; sometimes I wait for the spirit to form and be ready for the next step. YK: No, not at all. It is wood that is disappearing, not the furniture making, which is using the wood to make furniture.... wait! That makes wood very special, does it not? YK: Make a very clear idea of what you want to achieve. It does not really matter how old you are. The fact of knowing what you want already takes you half-way through. Then find the way to get there. This is where the difficult part comes in. Working hard in a certain direction, with a clear idea in mind, in the right environment, is probably the sort of thing you want, but how to combine all these things together? If you are not determined and sure, I would not recommend trying. You might be very disappointed or even harm yourself. You might be working everyday with extremely sharp tools. It is a dangerous thing to do if you don't put your mind to it. YK: Exhibition fees are expensive and they don't take place very often, which does not help to establish strong interactions with local communities. It is difficult to find a way to reach potential clients. The absence of local funds or other financial support from local governments for those who want to learn woodworking as a profession in Scotland. This is a problem I came across when trying to help one of my students find financial support. Above all, I would mention the lack of professionalism often implied in prioritising the financial side of the industry to the detriment of quality.